When American University asked if I could teach a section of creative nonfiction this fall, I was thrilled. I've spent much of this year strategizing and drafting essays, so their craft is on my mind right now. Although I get to engage both genres as part of the faculty for the University of Tampa's low-res MFA program, poetry commands most of my time and my student assignments. Also, AU is the program that sent me out into the world as a writer; the first alumnus portrait that comes up on their splash page shows Derrick Weston Brown, one of my classmates from days of workshopping poems with Henry Taylor, Myra Sklarew, and Cornelius Eady. I decided to emphasize essays that incorporate lyric energy, by which I mean energy that is grounded in perception by (or will of) the author over the material, versus a topic’s intrinsic narrative or suspense centered in plot. Signature elements of a lyric essay usually include framing figurative language, raw juxtapositions, and unconventional structures--for example, a personal revelation embedded within a seemingly objective encyclopedia entry. Poets who crossover to nonfiction are often drawn to lyric forms, which I have written about here. The great thing about teaching a class you've never taught before is that you get to envision everything from scratch--no preconceptions of the canon, nothing you're loyal to simply because you know it well. The terrifying things about a class you've never taught before is assembling a syllabus from scratch. 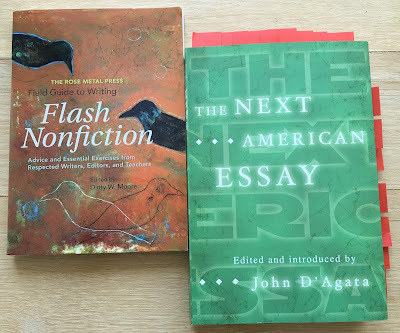 I chose two core texts to anchor the workshop, which meets on Mondays, and will always include at least twenty minutes of craft talk before we segue to discussing student drafts. The Rose Metal Press Field Guide to Writing Flash Nonfiction is a very straightforward and democratic guide, edited by Dinty Moore. 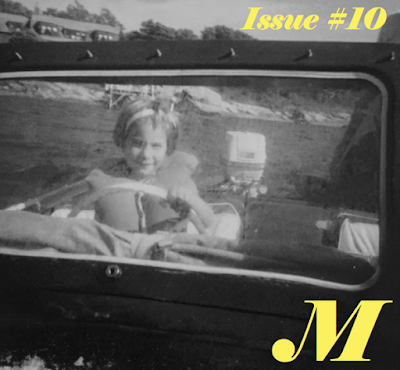 Each contributor--including Bret Lott, Robin Hemley, Aimee Nezhukumatathil, and Norma Elia Cantú--offers a brief essay on different aspects of flash nonfiction, accompanied by a prompt and an exemplar. Other than his introduction to the form and, implicitly, his shaping of the table of contents, Moore's voice is absent from the RMP anthology; he is happy to step back and let the contributors speak for themselves. In contrast, The Next American Essay, part of John D'Agata's trilogy of anthologies for Graywolf, embraces subjectivity. D'Agata's voice is interspersed throughout the collection, which is arranged chronologically from 1975 into the early 2000s, via prose-passages that comment on the particular moment in American literature--and sometimes D'Agata's personal biography, and sometimes the larger pop culture. I don't know if the students will find those passages useful; I don't know if they'll find them at all. I cherrypicked individual essays from within a slightly overwhelming (if very well curated) 450+ pages. Then, because that selection lacked pieces of the last decade, I added another nine pieces of my choosing. In addition, we have two weeks where we do not meet, so I've suggested hefty longform pieces--Joan Didion's "the White Album" and David Foster Wallace's "Ticket to the Fair," both conveniently anthologized by D'Agata --as supplemental reading. It is not your imagination if you find this reading list intensive. We have essays by thirty-some authors, plus lengthy suggested readings for the two weeks we do not meet in person. We will not always have a chance to discuss the readings fully, given the demands of our schedule. Here is my motive: being well read as a writer is a form of currency. If you stay in the publishing world, you will find yourself part of a thousand conversations in which the names of authors are dropped. When that happens, I have found that if I have even one genuine point of reference—that one essay I read, for that one class—I can contribute to the conversation with confidence. When I have no familiarity with the author, I’m a little embarrassed. I fall silent. 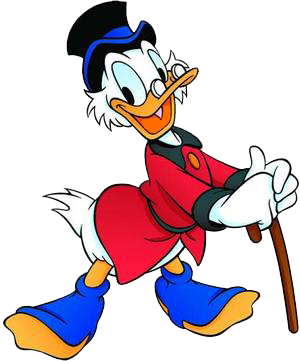 So our reading list is intended to fill your coffers, Scrooge McDuck-style. This is a pass / fail course with no pop quizzes. There may be days when you skim the reading and lay low during discussion, and no one is the wiser. That doesn’t make you a bad person—we all have weeks when we fall behind and need to cut ourselves some slack. But if you choose that path consistently, just be aware that you’re missing out. These readings, one and all, are ones that I wish that I’d gotten to digest during my MFA years. In addition to the reading, they'll be writing two longform essays, which I hope will incorporate lyric elements inspired by the readings, and four flash nonfiction pieces inspired by Rose Metal Press prompts. How will it all turn out? I have no idea. But I'm excited to find out. Class starts in the three hours. One of the unique components of a low-residency graduate program is the residency itself, which is often designed using the template of writer's conferences such as those at Sewanee or Bread Loaf. For the University of Tampa MFA instructors, this might mean that in a given 10-day stretch we're giving a craft talk in our genre (~20 poets), plus perhaps a craft talk to all students, in multiple genres (~80 people). That is in addition to leading eight sessions of a workshop with our 4-5 students, which I always lead off with a 20-minute close reading of poems framed as craft discussion. In other words: we've got craft coming out of our ears. It wasn't until I began to teach that I came to appreciate the art of smart, incisive yet conversational craft writing. It wasn't until I began to teach that I realized we needed more of such prose published, especially by women and voices of color. I'm not talking about book reviews. That is an important genre as well, but different in tone and intent. I've also encountered a lot of great self-reflexive craft pieces written in the past few years, views of "inside my process." Increasingly, such pieces are one of the myriad of ways we're asked to promote new work. Those are wonderful, but they often have hybrid qualities--they can very easily cross over into the realm of personal essay. I've worked in that mode myself, and will continue to do so, but I've really come to admire are crisp IM-personal essays that focus solely on outside authors and do not measure themselves by timeliness or relevance to a zeitgeist; they simply show us, line by line or phrase by phrase, how the language is exerting power on the page. One of my other responsibilities at UTampa is giving a pep talk to the Third-Termers, who are responsible for generating a 25-page critical essay on top of their standard responsibilities. This often freaks them out, because it feels like an arbitrary hoop to jump; irrelevant to their aspirations as a "creative" writer. But a good writer is a good writer, period. Coming at this as a mentor, the point isn't that I'm going to lose sleep if someone's citations aren't in perfect MLA format. The point is that someone who can't strategize a 25-page essay is also going to struggle with sustaining 250-page novel, or sifting and organizing 50 poems. The point, as well, is that the best gift you can make to a book you're passionate about, perhaps of a rarefied genre or by an author no longer with us, is to write something illuminative that makes others more likely to pick it up. One of my resolutions, in choosing to accept more teaching roles while still prioritizing my writing, was that I would generate at least one or two substantive craft essays each year. Since any book aspirations I have in this regard are at least five years out, that leaves me in search of great journal venues that are open to essays about craft. Not too long ago, I surveyed friends and fellow writers for their favorite publishing spaces, and with their contributions in hand, I give you this list. Note: I've included a couple of magazines where the craft writing is delegated to a particular space, e.g. the "Writers on Writing" blog for Passages North. Got a journal you think should be listed here? Let me know! I'm happy to expand. P.S. - If you missed it, I just did a sprawling interview for The Mackinac, Issue 10. This is a startlingly wonderful little journal that designs a custom "Liquor List" for each issue, in addition to a Spotify playlist. They asked me to send along two new poems, so I did. Thanks to the editors, Lenea Grace & Brookes Moody. I've been emailing with a high school teacher, planning toward National Poetry Month events next April. A lot of poets sigh for dramatic effect when April comes around--and I sigh too, primarily in dread of figuring out my tax forms. But I'm thrilled by the travel, which in 2017 will take me to Russell Sage College in upstate New York and Auburn University in Alabama, as well as the opportunity to do local outreach. Often, a conversation with a teacher includes a statement such as "Oh, good, we'll have just finished the poetry unit." But celebrating poetry in April would be so much easier if we didn't think of poetry in terms of "units," but rather an everyday presence. Kids grow up surrounded by language--newspapers and magazines, novels, comics and graphic novels, internet articles--and so they begin to absorb, organically, what makes for style and innovation in these modes. Part of the intimidation attached to poetry is that readers "new" to the genre worry that they aren't equipped to judge what is good. They don't trust their brain, which means they're afraid to get their hearts involved. 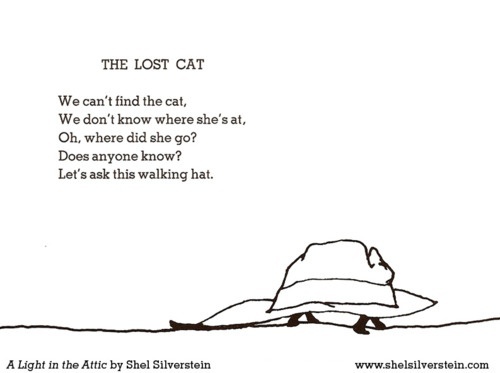 Those eight-year-olds who are passionate about Shel Silverstein? We need to find a way to keep them in the poetry fold. Those readers should become the eighteen-year-olds who are passionate about e.e. cummings. All of which is to say, I'm a huge fan of initiatives that implement poetry into daily life. In May, I got to serve as one of three judges for the student component of Arlington County's "Moving Words" competition, which puts the winners' work on metro buses all around town. I was startled by the images, originality, and intensity of voice. You can read all the winning poems here; as you'll see, age was no guarantee of dominance. My favorite, Lucy Rissmeyer's "Big Electric Cat," describes the cat's "Jelly bean toes, claws of broken glass." What makes us recognize these lines as poetry? When you read it aloud, what words do you notice? What would you do if you ran across this on your own? How and where would you put poetry in everyday places? What poem would you choose to display, and why? 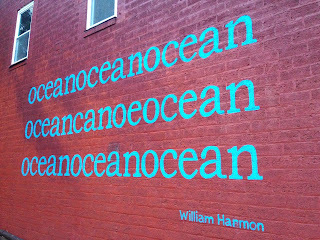 The concept is straightforward: take advantage of otherwise vacant wall space all around Charlotte by presenting brief, pithy poems in bright colors. The execution, directed by Amy Bagwell and her team, is unforgettable. For more on the Wall Poems initiative, check out their website. For a partial photo-"tour," go here. After your last slurp of spicy noodles, you reach for the satisfying crunch of a fortune cookie. 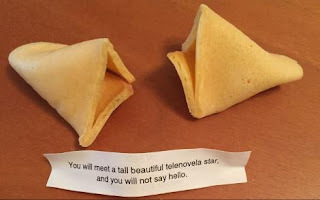 Instead, you find a riff on Frank O'Hara's "Lines for the Fortune Cookies." Created by Benjy Caplan for the annual O Miami festival and distributed by the midtown outpost of Delivery Dudes. Check out all the 2016 O Miami Festival's projects. Rain falls in downtown Boston, and a poem--perhaps Langston Hughes, perhaps Elizabeth McKim--materializes under your feet. Once stenciled, water-resistant "ink" lasts for about a month before naturally degrading. Mass Poetry's website has more on the project, curated by Boston's inaugural poet laureate, Danielle Georges. If teachers started off every month of the school year with a mention of poetry in the wild, rather than waiting for "the poetry unit," perhaps April could feel a little more like a celebration, and less like an indoctrination. P.S. - If you're wondering where I've been, the answer has largely been "writing essays" (more on that to come) and "in Florida," including our residency for the University of Tampa's MFA program and a week at the Hermitage Artist Retreat. I let this blog go dormant, and I took a Twitter hiatus, to see if I missed such things. I did. 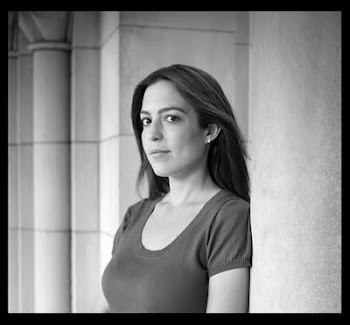 So I'm back, and back on Twitter too--you can find me there @SandraBeasley. P.S. 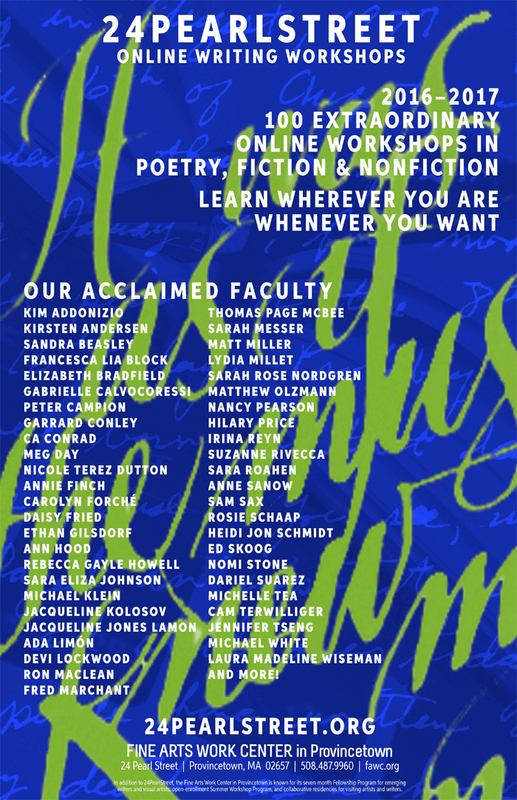 pt 2 - I'm teaching TWO poetry classes for the first time with 24PearlStreet, which is the online learning component of the legendary Fine Arts Work Center in Provincetown. Each is designed as a one-week intensive. Each will feature a mix of guided readings, revision of existing drafts, generative prompts for new ones, and my line edits on a few poems of your choice. "Your Voice: Work It, Raise It, Change It"
We often regard the author’s voice as having an inherent, unchangeable quality. Many writers have invoked the analogy comparing one’s voice to a fingerprint. But one person's “fingerprint” is another person’s rut, and no poet should feel trapped in his or her voice. "You Should Write Poems About That"
We are writers, but not just writers. We bring different areas of expertise to the table—whether a profession, another creative passion, travel, or the experience of parenting a sick child. Have you ever had someone say “You should write poems about that,” and not known where to begin? This one-week intensive course unlocks that material. -Early Registration Discount: Receive 15% off tuition if you register by October 1. -MFA Discount: If you have or are earning an MFA in Creative Writing, use code MFA50 for 50% off any one-week intensive class. If you're curious about these classes, email me; I'm happy to answer any questions.